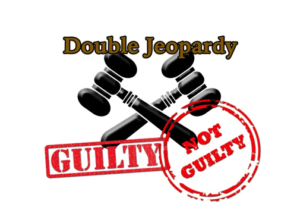 The most common usage of Rule 586 is when the Motion to Dismiss is filed on double jeopardy grounds stating specifically and with particularity the basis for the claim of double jeopardy and the facts that support this claim. Double jeopardy applies, for instance, when a Defendant is charged with a summary offense. He pays a fine to the District Judge and later he is charged with a more serious offense based on the same event. If it can be shown that the Commonwealth had an opportunity to file all the charges at once and not mislead an individual into admitting or pleading guilty to a summary offense then the rule of double jeopardy sets in and the Commonwealth shall not be afforded the opportunity to re-charge the Defendant on a more serious charge if the Defendant has admitted to the event and pled guilty to the summary offenses.